For months it seemed that Clinton was on a straight march to the White House, but the last two weeks have seen a dramatic change with Clinton and Trump now in a statistical tie. Trump is ahead in critical Florida, Ohio, and Iowa, but Clinton still has a very slight Electoral College advantage. With the first debate less than a week away it will be interesting to see what happens. While Trump is not in a technical lead, he seems to have gained some momentum. Clinton has ran on average 5 points ahead of Trump nationally for the duration of the campaign and her lead has now shrunk to less than 1 point per RealClearPolitics. 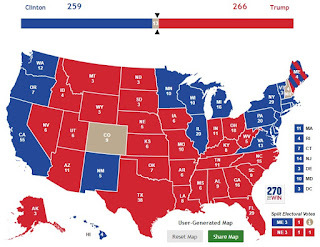 If the election breaks down like this, Trump could win with either N.H. or Colorado. Clinton would need both.